Rug Doctor is probably the most well-recognized leader in providing home users with DIY carpet cleaning machine equipment. Their forte has always been in commercial-grade rental cleaners. With this new Deep Cleaner 93146 model, Rug Doctor has applied their engineering expertise to create a durable and powerful consumer-grade carpet cleaner for home users. This Rug Doctor Deep Carpet Cleaner 93146 model promises professional cleaning results and is much less costly than the commercial-grade Rug Doctor extractor machine. This machine is recommended for regular carpet cleaning at home, and replaces the need to continually rent and drag home the commercial Rug Doctor for carpet cleaning. It can be used in between in-depth professional cleanings as well. The Rug Doctor Deep Carpet Cleaner features an advanced rotating and vibrating brushing system that will deep clean and jostle dirt particles off carpet threads. 11 amps is a high level of power for home carpet cleaners, and directly impacts cleaning and suction performance. Rug Doctor claims that in terms of suction power, their machine outperforms similar upright home carpet cleaners by as much as 75%. The cleaning path is 12 inches, which is the standard for home upright cleaners. It’s a good width for cleaning rooms and whole-house carpet cleaning. There are 2 easy lift-off removable tanks – one for filling with clean water and detergent. One for collecting waste water to be dumped. The cleaning system comes with a 7 3/4 feet flexible hose and a hand held brush tool for cleaning upholstery, furniture, hard-to-reach areas, stairs, auto interiors (carpets/upholstery). These can be carried in a detachable Tools Caddy. A cord length of 28 feet allows for a lot of cleaning to be done without having to plug and unplug the cleaner. The Rug Doctor Deep Carpet Cleaner 93146 comes with a 2-year limited warranty for normal household use. 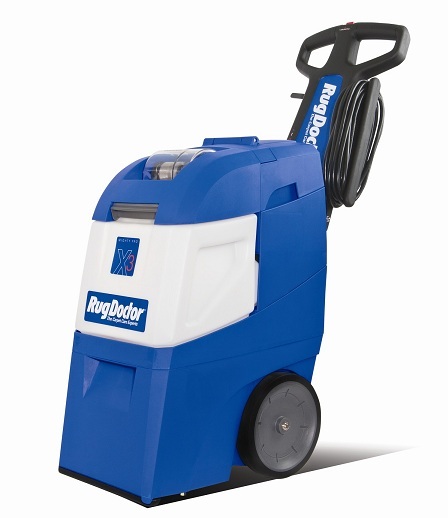 According to most users, the Rug Doctor Deep Carpet Cleaner extractor machine offers exceptional cleaning power. For pet owners, this machine can be a great help. A few dog lovers were thrilled that the machine was able to clean out dog poop and vomit incidents without difficulty. One gentleman had no problems cleaning out a set-in vomit stain. Part of the superb cleaning action can be attributed to the Rug Doctor cleaner machine’s dual-cross action brush system with 12 rows of bristles to agitate and lift dirt off carpet and rug fibers. With this technology, even older stains and pet messes have a good chance of being cleaned out. A number of users said that the cleaning results they experienced with this deep cleaner was on par with professional cleanings they’ve had in the past. Users also commented that they felt their Rug Doctor Deep Carpet Cleaner did a better job cleaning than their older Bissell and Hoover machines. In particular, one user felt that this Rug Doctor model cleaned better his previous Hoovers and Bissells, and he was surprised by how much water the Rug Doctor was able to suction up. Another user felt that the brushing mechanism was better than his previous Hoover, and that this Rug Doctor machine was easier to use. There are still users who said that they preferred their previous Hoovers/Bissells, but they appear more of a minority. One can think of the Rug Doctor Deep Cleaner as a high-end home upright cleaner, but it is not a heavy-duty professional grade machine like the ones that are rented out at grocery stores. In general, this cleaner machine is better built than the average consumer-grade carpet cleaners in the $150 to $200 price range. A small minority of users have reported problems with it. Although that is far from the norm, problems here and there do occur with regular consumer-grade machines. The good thing is that Rug Doctor provides a 2 year limited warranty with this machine, and they are good about providing support to customers. Some customers who experienced issues with their machines reported that Rug Doctor was willing to help, going as far as to send them over a replacement machine when the situation warranted it. Part of the reason for the excellent cleaning results is the high suction power of the machine. The machine motor has 11 amps of power. As a comparison, Hoover home carpet cleaners typically have 10 to 12 amps of power, while Bissell’s standard cleaners have around 6 amps of power. 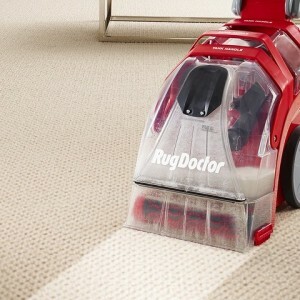 Rug Doctor claims that their machine has 75% more suction power than comparative home upright carpet extractors. High suction power means that more dirt will be extracted out of the carpet, leaving it cleaner. Another benefit of high suction power is that it minimizes dry time, since more liquid and moisture is lifted off the carpet. For areas with stubborn stains or really soiled areas, it would be helpful to use the Super Boost Spray function. The machine includes a dial for turning on an extra boost of detergent on the carpet. The actual spray is positioned on the back of the Rug Doctor upright deep cleaner, right on the path of cleaning, and clearly labeled. Besides relying on this spray boost feature, users can also pre-treat stained areas separately before running the Rug Doctor over the area. Dry Time is great with the Rug Doctor upright cleaner machine. As explained earlier, the high suction power of the machine helps. If the cleaned area is well-ventilated, it should not take more than half a day for the carpets to dry. The handle can be collapsed down for easier storage. The Rug Doctor deep carpet cleaner is very easy to use. You don’t even need a screwdriver – it comes fully assembled and ready to be put into action. The only piece that may take a little figuring out is the tool caddy that attaches to the back of the machine. It is removable, so users have the option to keep it on or off. If you are only cleaning carpets for the day, then it’s easier to keep this attachment off; it saves you from having to lug it around. What’s really nice is that the important parts are well-labeled, right on the machine itself. You know exactly where the clean and dirty water tanks are. To get started, you fill hot water into the clean water tank, and then detergent into the tank lid measuring cup. Then you press the Soap & Scrub button on top of the handle and pull the cleaner back to do a cleaning pass. Note that cleaning/extracting/suctioning is only done with through backward passes – when you pulled the machine back. If you’ve ever used the regular rental or professional grade Rug Doctor machine before, this one works similarly. After each backward pass, you will need to tilt the machine and push it back to the front. Fortunately, the machine comes with big wheels and is designed such that it can be operated easily. Many users have found this machine to be easy to use. The Rug Doctor Deep Carpet Cleaner 93146 package comes with a 7 3/4 inch hose and handtool (or handheld brush tool) for cleaning upholstery, auto interiors and hard to reach areas. You could use it for stairs as well, depending on how wide the steps are. The machine measures approximately 13 inches in width. If you just need to clean auto carpets and upholstery, furniture or stairs, you may want to consider getting the smaller Rug Doctor Portable. Otherwise, the Rug Doctor Deep Carpet Cleaner package itself allows for auto and upholstery cleaning. Note that the handheld brush tool does not feature motorized or turbo brushing. This means that the brushes are stationery, so the scrubbing is all manual. Even though it may sound less powerful, the cleaning effect is still tremendous. The good suction power will remove a lot of the dirt. This deep carpet extractor has received the CRI’s (Carpet and Rug Institute) Gold Seal award – an industry standard that tests for cleaning effectiveness and more. Most home carpet cleaners do not have this certification, but Rug Doctor machines and industrial grade cleaning machines have traditionally been submitted for this certification to give them added credibility. It’s a great point that even though this is Rug Doctor’s consumer-grade model, it also meets the CRI’s Gold Seal standards. To date, neither Hoover nor Bissell’s home carpet cleaners feature this certification. The Rug Doctor Deep Carpet Cleaner is an extremely well-built and sturdy machine. Most home upright cleaners tend to be somewhat weaker in their build, but not this one. One online reviewer even wrote that he thinks the machine will outlive his carpets! The Rug Doctor Deep Carpet Cleaner cost about $50 to $100 more than what a regular home upright cleaner costs, but it does offer better workmanship and a high quality build. Not only is the machine of quality workmanship, but it is good-looking and designed to work very well on a practical level. Rug Doctor hired a well-known industrial design firm, Nottingham Spirk to bring about this design. Nottingham Spirk is also the industrial firm behind products like the Swiffer SweeperVac and Dirt Devil products. At around 25 pounds, the Rug Doctor Deep Carpet Cleaner is a somewhat heavy home upright carpet cleaner. If you add in the weight of 8 pounds for a gallon of water, you will be lugging around quite a heavy load. Fortunately, the Rug Doctor is well-designed with large carpet friendly wheels. Although some users felt intimidated by the weight of the machine initially, they found that it was easy to move and maneuver with the wheels. In addition, for easier handling, the machine handle is adjustable and comes with a comfort grip design. The machine dimensions are 43.5 inches (height), 12.5 inches (width) and 24 inches (depth). For storage purposes, the machine handle can be folded down to 20.5 inches/25.5 inches (with tool caddy), but it will increase the depth measurement to 26 inches. These measurements are approximate. With a list price close to three hundred dollars, the Rug Doctor Deep Carpet Cleaner costs more than other popular home carpet extractor machines. It offers exceptional quality engineering for a home carpet cleaner model – we could say that it is priced just right – more expensive than the typical home carpet cleaner model but less expensive than a professional grade one. The Rug Doctor Deep Cleaner 93146 is best recommended for households who appreciate the machine’s combination of features like its exceptional cleaning power, great design and high quality build. For shoppers on a budget, there are lower cost options available through Hoover or Bissell, and those machines can offer tremendous benefits as well. There are many choices of cleaning detergent on the market today, but Rug Doctor recommends using their branded solution. Most home carpet cleaning machine companies recommend using their branded detergent as they are formulated to work best with their machines. Many Rug Doctor Deep Cleaner users also report really good results when they’ve used Rug Doctor branded solutions. Here are the most popular ones to check out: Rug Doctor Oxy Pro Carpet Cleaner, 64oz and Rug Doctor Pet Pro Carpet Cleaner, 64oz . Should You Buy The Rug Doctor Deep Carpet Cleaner? Having a Rug Doctor machine at home will allow you to enjoy clean carpets while saving money and hassle on repeated machine rentals or hiring professional cleaners. The Rug Doctor Deep Carpet Cleaner combines stellar cleaning power with quality workmanship. 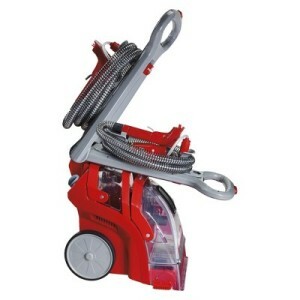 Based on user feedback over time, it’s a sturdy high quality machine that delivers near professional cleaning results. The machine features an effective vibrating brush mechanism, high suction power and quality workmanship. It costs more than the average consumer-grade cleaner, but it offers a higher quality build that minimizes the potential for problems. More Amazon user comments about how the Rug Doctor upright cleaner compares with Bissell machines can be found here. What a former professional carpet cleaner said about the Rug Doctor Deep Cleaner – User Review with Before & After Pictures – Boatboy63’s Amazon review on the performance of the machine, including the deep cleaner’s ability to suction. The reviewer offers numerous tips on how to use this machine well. Finally, there is a video recording of three pictures (before, during, after) that showed results from cleaning a soiled carpet. Rug Doctor Deep Cleaner User Review with Before & After Pictures Comparison (from Amazon.com) – Chris thought his carpets were in such bad shape that they needed to be replaced. Check out how this machine was able to help. Not sure if this Rug Doctor deep cleaner is right for you? Check out more reviews of the top carpet cleaners. 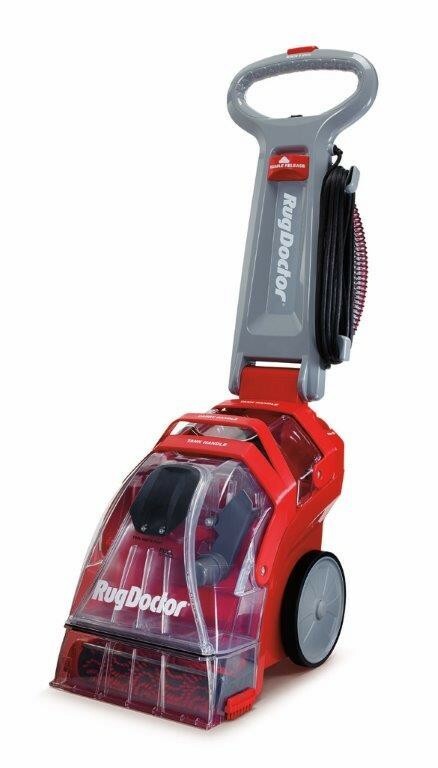 Compare this with other Rug Doctor machines: Rug Doctor Commercial-grade and Rug Doctor Portable Spot Cleaner. Professional/Light Commercial cleaners cost about $100 to $150 more, but they are the best cleaners for home users that money can buy. Compare regular grade and professional grade carpet cleaners.